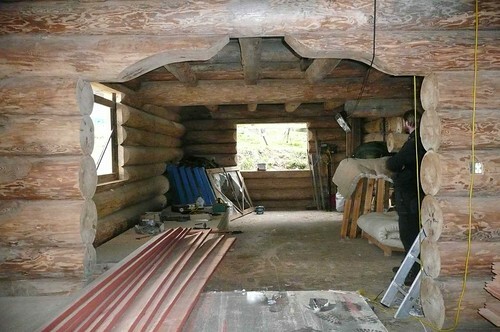 Allan is building a log house high on a hill near Evanton, north of Inverness. The locally sourced Scots Pine logs are scribed and cut to fit snugly together and are notched so that they interlock at the corners. The logs in the house weigh about 80 tonnes. After digging back into the hillside a basement was built out of concrete blocks. On top of this sits the two storey[for the purposes of part B (fire) of the Approved Documents to the Building Regulations] this includes - (a) any gallery[for the purposes of part B of the Approved Documents] - A raised area or platform around the sides or at the back of a room which provides extra space. if its area is more than half that of the space into which it projects; and (b) a roof, unless it is accessible only for maintenance and repair. house with a turf roof. Floors will be screed on an OSBOriented Strand Board sub floor. OSB is made locally. Logs are moved around with a telescopic crane. The logs are laid so that thick and thin ends alternate so that they keep roughly level. Each log is lifted into place and scribed against the log below using a special scriber with dual bubbles to keep it level as it is run along the log. The log is then lifted down and cut using a chain saw so that it matches the shape of the log it is going on. 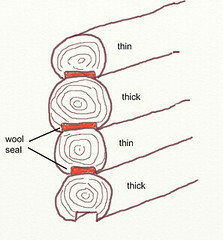 A groove is then cut along the length of the log with a chain saw and the groove is packed with wool which when compressed will act as an air seal. At corners the logs are carefully notched so that they interlock top and bottom. It is important to choose logs of the correct size so that at corners the notches space out correctly between the two walls. Apart from that the logs are not tied together in any way. Over time the logs will settle by about 2% and shrink about 4% laterally but very little along their length. 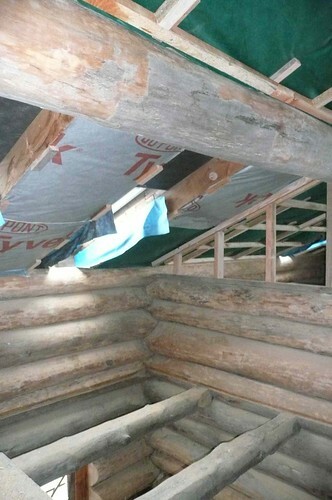 A room in the roof area with a purlin at the top and floor beams below. Vapour open (breathing) Tyvek membrane is being fitted over the roof joists as an air seal. The house is just about to have its windows and doors fixed in position. Eventually it will have underfloor heating powered by a wood stove with a heat store. There will be a 2 kWkilowatt - a measure of how fast energy is flowing. e.g. electricity might flow through an electric kettle element at the rate of 2 kW wind generator and batteries, inverter etc. The timber has all been treated externally with Stokholm tar. Pine tar is available from Auson in Sweden at about £3/liter. It is their type 850. This is mixed with equal amounts of gum turpentine and linseed oil, raw or boiled. See also the Tarinol web site (and let Google translate it from the Norwegian). The treatment will need repeating about every 5 years. This traditional method of building, known as Brettstapel is very old. It is believed that the timber Saxon church of St. Andrew’s at Greensted is about 950 years old and still in use. It is the oldest timber building still standing in Europe. Norway has a great tradition of log building which they may have developed from older Russian techniques and handed on to North American builders. 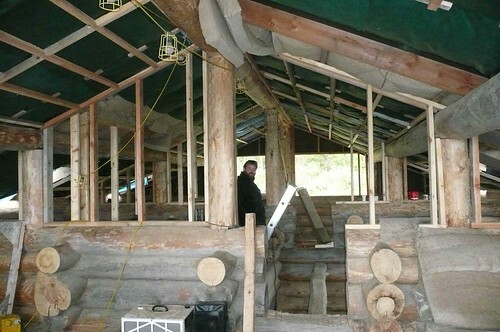 Woodenways run courses in log building. Hello there, did you have to get planning permission for this? If so, how difficult was it? We are looking at buying a plot of cheap agricultural land/ paddock land to built a log house to live in, any tips? We are always looking for a regular supply of tarinol as we protect the sitka spruce cladding of our wee house with it every year AND it smells wonderful! I am the happy owner of http://www.tarinol.no. I am very pleased to learn that even UK log builders found it worth looking at my web page. Should any of you require pure pine tar, linseedoil or some of the things from tarinol, please do not hesitate to contact me. According to the forwarding company transport to UK is only slightly more expensive than Scandinavia. Consequently I am ready at this moment to offer same service at same price to UK as you see for Norway. Should anything change (transport costs etc) I will abviously have to reconsider.